As a parting gift to the U.S. territory island of Puerto Rico, with seven months left in his term, in May 2015, governor Alejandro Garcia Padilla signed an executive order to legalize marijuana for medicinal use. It wasn’t clear whether Mr. Garcia Padilla’s successor would honor the executive order, but on December 30, 2016 — three days before Ricardo Roselló Nevares was sworn in — The Health Clinic, the island’s first dispensary, opened.Although medicinal marijuana was approved to treat 19 specific ailments, signups for medical marijuana cards were initially slow. Only 12,000 patients registered in the first six months. I’ve talked with friends, people I’ve met at my dispensary, and folks I surveyed at the December 2018 MedCannBiz conference. All of them blamed the lengthy and expensive process of becoming legal.In the early days, there weren’t many doctors with medical marijuana licenses. See a licensed medical marijuana doctor (who likely wasn’t your primary care physician). See a lawyer (who serves as a notary) for an affidavit certifying the doctor’s recommendation. This cost $35. Wait four to six weeks for a call to pick up a sealed envelope that contained your card and a packet with your doctor’s recommendation. You could then bring the sealed packet to the dispensary of your choice. If you made a mistake in choosing a dispensary, or wanted to check out more than one dispensary, the Department of Health would give you another sealed packet to bring to your second choice. In other words, there was no central location on the web where doctors and lawyers could input their portions, the Department of Health could approve (or not), and give all dispensaries access to your approved recommendation. It was cumbersome to say the least, but many of us early cardholders assumed the bugs would be worked out… eventually. Six weeks later, we were hit by Hurricane Maria — the most destructive hurricane in Puerto Rico’s recorded history. Only nine months in office, Governor Rosselló had an insurmountable task ahead of him. Reopen businesses as quickly as possible to prevent a massive diaspora to the U.S.
With many marijuana crops destroyed, and manufacturing plants and dispensaries badly damaged, there was obvious and real concern about whether the industry could survive such a devastating blow. And equally important, with a real crisis on Rosselló’s hands, how to avoid having his administration lose perspective on medical marijuana meeting its objectives. In their efforts to rebuild shattered facilities, dispensary owners faced insurmountable financial obstacles. Their insurance payouts were often a fraction of what they were expecting to receive (based on their policies). Adding insult to injury, under U.S. law dispensaries were not eligible to receive federal disaster aid disbursements to make up the difference, since the cannabis trade is still classified as illicit commerce by the [U.S.] federal government. Down but not out, by the end of October, three quarters of the island’s dispensaries that were operating pre-Maria reopened. THC was one of them. Aleczer Rivera told me that for both financial and psychological reasons, the sooner he could reopen his dispensary the better. The Health Clinic (THC) owner, Jose Aleczer Rivera addressing the Puerto Rico House of Representatives in 2018 about cannabis. Getting his crew back to work as quickly as possible, he surmised, would help them fix their homes right away and get them back to normal faster. Doing so also helped them all overcome their feelings of powerlessness — something anyone who’s been through a natural disaster can understand. Along with reopening THC, Aleczer Rivera hired a new manager named Ramon Rosario. Coming from the auto industry, Ramon was the only member of THC’s team who wasn’t a medical cannabis patient. I’m going to put a pin here and return to Rosario’s story later. The industry definitely took a huge hit. Indeed, there were continued impediments: the cumbersome and costly application process, weeks-long waits for dispensaries to reopen and the limited supply when they did reopen. However, between the rapidly rising popularity of medicinal cannabis and the necessity to regain control following Maria, dispensaries were positioned to recover well. As an additional boost, reciprocity agreementswith weed-legal U.S. states allowed dispensaries to accept out-of-state medical marijuana cards, deepening the pool of potential patients even further. Residents of those states could obtain the flower and extracts they needed while staying in Puerto Rico. I talked with several volunteers who wanted to help in any way they could and contractors who came to assist PREPA (the island’s electric utility) in rebuilding our power grid, who told me part of the draw was knowing they wouldn’t have to cease taking their MMJ while helping us get us back on our feet. As has been widely reported, Hurricane Maria knocked out power across the entire island. Closer to the metropolitan area, many pueblos (towns) had power restored within a month, while others remained in the dark into the new year and beyond. With power still out in Barceloneta (about an hour west of San Juan and home to the premium outlet stores), in the wee hours of one night in January 2018, The Health Clinic was burglarized. Power for the cameras wasn’t rerouted to the generator, and robbers got away with an estimated $90,000 in inventory and cash. They broke most of the windows and ransacked the dispensary. Everyone I knew (including me) whose recommendation included flower ignored this rumor. We knew the justification was based on flawed data and believed they would acquiesce. One day in June 2018, I walked into my dispensary and was directed to read something issued by the Department of Health. It said that in order to continue being able to buy flower, I had to get recertified with an approved justification for flower. I went to several cannabis doctors and not one would certify me for flower. They wouldn’t listen to me; they just rejected my request. Back to San Juan I went, and this time I visited the offices of Fundacíon Free Juana. Free Juana serves many purposes: they educate and certify budtenders. They educate consumers, they’re very prominent in the annual Puerto Rico 420 Rally, and they also have doctors who aren’t afraid to ask the tough questions to help them determine if patients’ needs qualify for the flower exemption. After listening to me and asking me numerous questions, the doctor certified me for flower use. Unfortunately, not every patient has the time to drive to San Juan to achieve this. Despite the destruction of the hurricane and the ban on flower, the industry has continued to recover. Growers, manufacturers, and dispensaries reopened. And new dispensaries even got in the game. [Vur-jer] opened in Manatí (about 45 minutes west of San Juan) in July 2018. Left to right: Gabriel, Erica and Francis of [Vur-jer]. One of the owners, Gwen Black, describes Vur-jer as a “medical cannabis dispensary with the mindset of a wellness center, supporting the physical internal functions of a healthier body, mind, and spirit (e.g. nutrition, fitness, acupuncture, meditation, yoga, energy healing, and self-care).”When former governor Garcia Padilla legalized marijuana for medicinal use, Black, who had moved back home to Puerto Rico from Southern California two years earlier, decided to open a dispensary. Black and her two partners set out to find a location. Opposite the Manatí Medical Center and a two-minute drive from the larger of the two Manatí hospitals, Doctor Center, [Vur-jer]’s space is large, open, and well laid out.As of November 2018, there were 54 medical marijuana dispensaries open in Puerto Rico — almost double the number pre-Hurricane Maria, an impressive achievement by any measure. On the anniversary of Maria, the number of patients who’d received their medical marijuana ID cards was up to 34,000. In early December, Puerto Rico CannaBiz brought growers, manufacturers, dispensaries, advocates, policymakers, and patients together for their fourth two-day conference. At the conference, patients could sign up and receive their medical marijuana card on the same day — for a one-time, all-inclusive price: $20. CannaBiz reported in their December newsletter that 1,200 new patients took advantage of the offer. Incredibly, and seemingly against all odds, dispensaries are actually more plentiful and busier now than they were in 2017. Despite continued problems obtaining adequate supplies (growers and manufacturers have had greater challenges to overcome than retailers and are still in the recovery phase), dispensaries in 2018 are offering a greater variety of products in response to customer demand. Flower comprised the bulk of medical marijuana sales in Puerto Rico in 2017, but dispensaries are now expanding their inventory to include wider varieties of edibles, capsules, sublingual and vaping oils, waxes, suppositories, patches, and topical applications — some created to pay homage to the island, the resilience of the people and Puerto Rican Pride. Imagine your favorite strain infused with tropical fruit flavors to make mango, coconut, watermelon, pineapple, lemon,, and guava gummies and vaping oils. A favorite in Puerto Rican cuisine, arroz con gandules (rice with pigeon peas) is a delicious way to get your “greens.” If you’ve ever been to Puerto Rico at Christmas, you’ve probably been offered a Coquito, the island’s signature eggnog-esque holiday alcoholic beverage. Made by NextGen Pharma, the rum is replaced with 60mg of THC. In early November 2018, NextGen Pharma teamed up with Draco Rosato create medical cannabis products licensed under the name MonteSagrado. It’s been widely publicized that Draco (singer, songwriter and composer-turned-business owner and philanthropist who wrote “La Vida Loca,” “She Bangs,” and others) survived non-Hodgkin lymphoma. His cannabis line mirrors the strains and terpenoids he used while undergoing both Western and alternative approaches to treating his cancer. So, where are things headed for dispensaries in Puerto Rico? The Health Clinic waited for the CannaBiz conference to make an announcement. Looking ahead to 2019, Aleczer Rivera has big plans: He is opening four new dispensaries. Two will be in the San Juan metro area (Avenida Kennedy and Punta Las Marias), one in Arecibo, and another in Mayagüez will join Barceloneta. With 3,200 square feet, the Avenida Kennedy dispensary will double as an artist space. That’s all Aleczer Rivera would divulge. And remember Ramon Rosario, the only non-patient on THC’s team? He was bumped up to general manager, overseeing all five dispensaries. Rosario is one of the hardest working people I know in this industry. Coming from the auto industry, he had a steep learning curve. Today, he can hold his own in a conversation with any person with a deep knowledge of cannabis. Ruth Reyes has been with THC since before they opened on December 30, 2016. She is the 10th employee in the Puerto Rico cannabis industry. Ruth has been president of the Budtenders Association for the last two years. While the growth in the number of dispensaries is impressive, there are still barriers they must overcome. 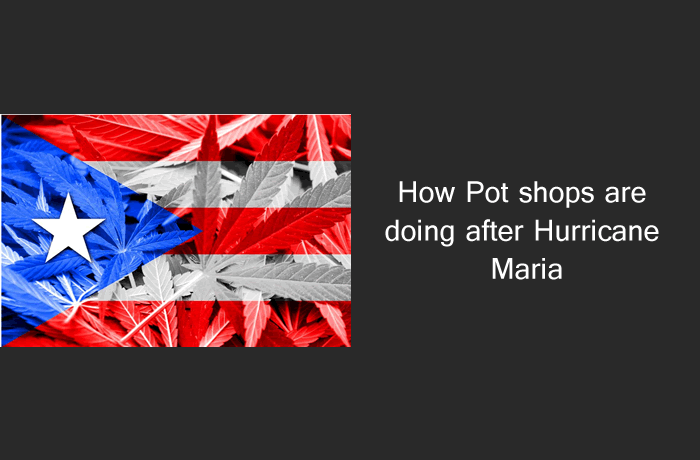 Poverty, unemployment, and high public debt, all of which were exacerbated by Hurricane Maria, continue to plague the Puerto Rican economy, and that ultimately affects all retailers including medical marijuana dispensaries. And the problems with banks that affect dispensaries in states with legal marijuana will continue to cause difficulties in Puerto Rico as well. Because U.S. financial regulations prohibit banks from doing business with the cannabis industry, dispensaries are forced to function as cash-only enterprises, which creates security difficulties and other inconveniences for dispensaries and customers alike. But despite the difficulties, the dramatic expansion in the number of dispensaries over the past 14 months reveals the depth of potential the cannabis industry in Puerto Rico possesses. One of the worst natural disasters imaginable wasn’t enough to derail it, and that bodes well for medicinal cannabis entrepreneurs who intend to invest in Puerto Rico in the years to come.